10,000 offers Yields 50 Parcels and $100,000 Net which is a great ROI. Jack Butala: 10,000 offers Yields 50 Parcels and $100,000 Net. Every Single month we give away a property for free. It’s super simple to qualify. Two simple steps. Leave us your feedback for this podcast on iTunes and number two, get the free ebook at landacademy.com, you don’t even have to read it. Thanks for listening. Jack Butala: Welcome to the show. 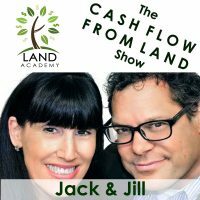 In this episode Jill and I talk about 10,000 offers yields 50 parcels and a hundred grand that … Is that too many numbers in the title there? Jill DeWit: That’s a lot of numbers. Jack Butala: If you send out 10,000 offers you’re going to buy 50 properties and probably net about a hundred grand. Jack Butala: Great show today. We do it all the time. Great show today, Jill. Before we get started, let’s share something interesting that happened to us lately. Jill DeWit: All right. This is a good. Jack and I were talking this morning. Actually we were talking last night and we’ve got some individuals in our world that we cannot really share their names so we gave them nicknames because of … That’s nothing political. Jack Butala: No, you’ve got to stop with he politics. Jill DeWit: It’s all under contract. We can’t talk about stuff yet, but anyway. We had a come up with some names for these people, that’s why it’s The Rancher, The Canadian, The Disney princess and I’m thinking people around us are thinking that we write children’s books. Jack Butala: But, we do. Jack Butala: I mean this is kind of … I don’t know. No we don’t. It’s actually a little more serious. It could be, though. Jack Butala: They really are a rancher. Jill DeWit: That’s who the Disney Princess is. Now, I get it. We’ve got some good stuff that we’re working on and it’s not even really in our … It’s a whole Jill offshoot thing that’s coming. Jill DeWit: It is inspiration. Jack Butala: I love the stuff you’re working on. Jack Butala: I’m jealous a little bit. It’s really cool. Jack Butala: I’m stuck in real estate forever. Jill DeWit: Oh gosh. You’re silly. It’s good. Jack Butala: Let’s take a question posted by one of our members in successplant.com, our free online community. Jill DeWit: Milan asked, speaking of Canadians. Jack Butala: Do you know every single member by first name? Do you know Milan? Jill DeWit: I know Milan. Jill DeWit: I don’t know every single one that closely. Jack Butala: Because that would be absolutely amazing. Jill DeWit: It would be amazing, but you know what? I know a lot about all most of our members, which is cool because we have a really good community. A real tight community. Jack Butala: Oh I’m sorry. Jack Butala: That I’m not a crook. Jill DeWit: Because I think you’re clearly in new, right? Is she new or is it a he? Jill DeWit: He’s not “new” new, but I don’t know how many transactions he’s done. Jack Butala: Cutting to the chase at your level, I would suggest that you close with escrow. We don’t have to do that anymore because what we say is, “Please look us up on the Internet. We’ve completed almost 16,000 transactions and we offer that escrow piece too. We ask that they pay for it. With 40 acres if you’re selling for ten or fifteen or twenty grand. I don’t think that’s unreasonable. In fact, I would actually suggest that you go through escrow. People do it with us because we’ve closed a lot of deals with them. Jill and I received hundreds of thousands of dollars in wire transfers. Regularly, actually and it’s just because we’ve done so many deals and they’re wholesale price and they just trust us. Once you’ve established trust, you can do whatever you want right out of the gate open escrow. Jill DeWit: Exactly. So that’s perfect. That that solves that right now and that price point. What if it’s a $400 property error, $500 or just a $1000 or something like that where now … ? Say you bought it for $100. A lot of our members do this all the time. They’re buying properties for $100 and selling it for $1000. Jill DeWit: They just keep doing that. They’re very happy with that. Now, a $500 plus escrow doesn’t make sense. I get it. You need to start building up your reputation and how do you do that? By your website. By your Facebook Live … Facebook live, by Facebook like. Sorry, I interrupted so it’s all good. Jack Butala: It’s all good. Jill DeWit: That’s true. We have for our members, they’re in our community. We have a little logo we let [crosstalk 00:05:39]. Jack Butala: Academy certified thing, which seems to help. Jack Butala: They put it on their website. Jack Butala: They have a very good reputation so please don’t wreck it. Jill DeWit: Yeah it’s true. You can use it … No, just kidding. Jack Butala: Jill and I were talking about this this weekend. Two years ago, some N.B.A. player took a big huge poop in one of his teammate’s shoes. Jack Butala: So, he went and did a press conference and he said, “Yeah I did it. I absolutely did it but everybody only really cares about the fact that I pooped in this guy’s shoe. They didn’t ask why. No one’s asked me why.” [crosstalk 00:06:20]. We’ve done 16,000 deals, but all it would take is one deal to go really South, really bad and for everybody to hear about it and then they wouldn’t even care. Then we would be starting over. Jill DeWit: That’s true. Yeah, that’s good. As you build up your reputation make sure it’s a good one. That goes back to you and I. We always say that it’s important to do the right thing even if it costs money. You just have to do it. Jack Butala: You have to say “poop” because this is Rated G.
Jill DeWit: That’s true. Have we refunded properties because people didn’t … It wasn’t what they thought? Absolutely. It was never anything shady. Jack Butala: Yeah, they just changed their mind. Jill DeWit: They changed their mind. Jack Butala: Buyer’s remorse or whatever. Jill DeWit: You know what? That’s who we are. We’re not going to dig our … You bought it. It’s not returnable. There’s a shelving, there’s a stocking fee. Jack Butala: Nine times out of ten, we go and sell it for more just to make that point. It’s really no big deal. A shelving fee. Jack Butala: Oh, my God, we should do that. Jack Butala: A restocking fee. Jill DeWit: … If you return this property, there’s a 10% restocking fee. Jack Butala: Try to put forty acres in your purse. Jill DeWit: I’ve got to go clean it up now again. Jill DeWit: I have to bring the house person in, the house cleaner in and clean up our vacant land. Jack Butala: Like If you smoke some cigarettes in a hotel room, there’s a cleaning fee. Like that. I had to go clean it up. Jill DeWit: Exactly. There you go. That would be really funny. All right. Jack Butala: You have a question or you want to be on the show, reach out to either one of us at successplant.com. Today’s topic … I can’t wait to explain this. Today’s topic is 10,000 offers yield 50 parcels purchased and $100,000 net. So yeah, there’s a lot of numbers in this title. If you send out 10,000 offers, and I don’t mean just shotgun the heck out of it, any old 10,000 people who own property. If you’re smart about it and you’d send out and strategic t10,000 offers, you will buy about 50 properties and you’ll net at least, this is on the low end, you’re going to make 2000 bucks a property. Right? Jill DeWit: Um hum (Affirmative). [crosstalk 00:08:35]. I’m not playing that game. I’m getting your little thing set up here while we’re talking. Jack Butala: Jill and I struggle all the time to try to make this sound bite, if you know what I mean. Try to make it so that everybody can really understand how big this can get. If you mail out ten thousand offers and the way that you do it, it’s going to cost about four grand with us. Maybe $4500 because we negotiated an unbelievable deal with an extremely automated printer. You send of the 10,000 units that you want. Just mail a letter and send them the document that you want to … The offer, the document that you want to send. Jack Butala: They put the whole mail merge together for you and they come back. On average, you should get about50 properties back. Oh my God, what do you do when you get the 50 properties back? They sign an agreement and send it back. If you don’t have any money, and a lot of people don’t, they send them to us, they send them to other members in our group who do have a lot of money but don’t, for every reason, want to learn how to do this and you partnership the thing up. There is way more money out there than sense. Jack Butala: There’s a lot of wealthy lazy people who just would love to buy a piece of property they know is worth half. Have you do all the work, put no money in and split the profit. Jill DeWit: Jack, on Wednesdays, you do DR views for people. Can you give us some … and I know you talked about people at this level. You talk about how many offers are sending out, what’s coming back, what they did. Can you give us some without saying any names or real details. Can you give us some of that information? Jack Butala: Yes, on Wednesday, we have a product called Deal Review, so it’s only open to our members and they can schedule a time. Automatedly schedule a time to do a Skype audio review where we can screen share and it’s just that where they’d say, “Hey, I did all this stuff. You’re right it works. I’m reviewing these ten offers or one offer or three. What you think? Would you do this deal? Will you bless it or not? About 50% of the time I say yes, but what Jill’s probably referring to is we have one in member in particular who is just for whatever reason taking this extremely seriously. He’s making well over one hundred grand a month with us. He’s almost at our level. Jack Butala: Actually, about 12 people. Jill DeWit: We have a couple that’s doing a deal a day. Jack Butala: At that level, a lot of them are just making like $10,000 a month, $15,000 a month. Jack Butala: Which is nothing to sneeze at. Jack Butala: With full time jobs. Jack Butala: Was that the answer to your question, though? Jill DeWit: I wanted to give you some real examples of some of the properties and some of the details because it’s one thing to say … Make the statement like you just did. What you can expect with this many mailers and da, da, da. It’s nice to hear. “Hey, I got a guy who zeroed in on 40 acre properties or 5 acre properties. He’s buying them for this, selling for this. This is how we get them out. Jack Butala: Yeah, here’s a, without much in this guy’s name at all. In fact it’s not just one person that I going to throw in a few examples. They’re purchasing 160 acres in New Mexico, southeastern part of New Mexico that’s adjacent to a working ranch. All four sides have county maintained roads. He bought that property for $10,000, 160 acres and he did all the marketing on it. Actually, hired some drone people to go out there and do a whole drone thing on it. Came out really cool. Jack Butala: He went to way more lengths than we do now. Jack Butala: We would buy a property like that and just send it remedially to our guys and prep for $8-10,000,I think he paid. We would sell that for 25 or 32 wholesale. It’s where one of our guys … And never even [crosstalk 00:12:26]. Jill DeWit: And walk away. Jack Butala: It would never hit the internet. Jack Butala: That’s a business we’re in, but we all started in retail like that. What ended up happening is he wrote a letter to the two adjacent ranchers and the one guy said, “Hell yes. Where do I send you $60,000 right now?” We made$50,000. Jack Butala: … Or so and without any realtors or any of that stuff. So, that’s one deal with it. Another deal that comes to mind is from a different buyers of property. It has a waterfront property in California in the Big Bear area. It’s not in Big Bear and for whatever you did a bunch of research. He bought the property for $22,000 I think was 40 acres or 30. Did a bunch of research and found out that there’s agricultural permits in this area to grow marijuana. I don’t care about marijuana. Jack Butala: I don’t care how you feel about marijuana. Let’s just say it’s corn. Jack Butala: To grow a crop and in so that he ended up selling it for a lot. It was expensive, $120,000 or so. Jill DeWit: That’s funny how much that keeps popping up in our world by the way. Jill DeWit: There’s a whole thing … Not corn. No there’s a whole thing. Our online community, it’s called Success Plant right now. Jill DeWit: … Somehow and especially in some states. Jack Butala: Specific counties too. Jill DeWit: Counties where it’s apparently … They welcome it. Gosh, I’m sure there’s tax money there for them, so it’s great. It’s just funny how much that keeps popping up. Jack Butala: Right. My whole point of the show is if you send a bunch of offers out and you’re smart about it, you’re going to buy some property and you’re going to be shocked at how cheap you buy property because I just want to sell it. Jill DeWit: We use it every day to pry property for half of what it’s worth and sell it immediately. Jack Butala: You are not alone in your real estate ambition. These are almost all this week. Jack Butala: We need a good fun Jill show. Jill DeWit: I know. I’m just kidding. Yeah, thank you. Aren’t I fun anyway? Jack Butala: Oh you’re a blast. [crosstalk 00:14:56]. Jill DeWit: It is pretty technical stuff. Jack Butala: I’m just talking more than I usually do and it’s cool. Jill DeWit: Okay. Got it. You know what I keep doing? I’m sitting in this room with microphones now everywhere, so I don’t know where to look and who to talk to. Jack Butala: You know me. There’s so many buttons in here. You ever seen in movies where there’s a flashing button and the smart guy in the room says, “Do not press that button”? Jill DeWit: It’s a red button and there’s a case … [crosstalk 00:15:20]. Jack Butala: Look behind you. There’s buttons everywhere. Down here you can’t see them, but I want to push them all. Jack Butala: One might make the roof come off. Jill DeWit: Exactly. Like we’re going to blast out, eject. “Eject”. That’s the only one I don’t see here. Jack Butala: I need an ejection button. We all need an ejection button. Jack Butala: I really need to get out of the situation now. Jill DeWit: We talked about reset. I just want to reset button. You want to eject. I want to do it all over again. I could use it today, actually. Reset.